OS grid reference SE 2266 8066. In the Valley of the River Ure, Wensleydale, 8 miles to the north-west of Ripon and some 4 miles west of the A1 in north Yorkshire stands the picturesque market village of Masham on the A6108 and, close to the market square is the ancient church of St. Mary the Virgin. Just by the south porch there is a quite rare Anglo-Saxon cross-shaft Masham Churchyard Cross which originally had some of the best carvings in the Dales, but sadly these ancient carvings are now rather weather worn. St. Mary’s church also houses two pieces of a Saxon cross. 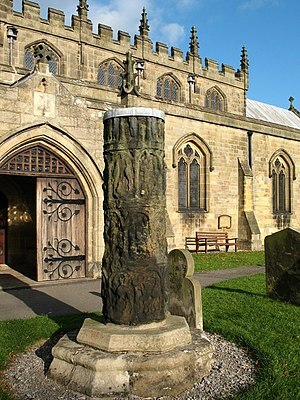 In front of the porch stands a 7 foot (2.1 metre) high rounded cross-shaft, or pillar cross, said to date back to the 8th or 9th century AD, and probably of Northumbrian craftsmanship. It stands upon a modern stepped base that, sadly, does not do the ancient cross any justice. The top is now protected by a lead cap. Despite being heavily weather-worn the richly carved shaft is quite splendid with much beautiful carving. The cross-head has long since gone. This is a four-sectioned shaft with carvings inside round-headed arcades. Just below the top damaged section Our Lord and the Apostles are depicted, while below that are what appear to be human figures awaiting baptism, or being baptised, and also the Adoration of the Magi. But the carvings are badly worn and are now difficult to make out. It could be that the cross was set-up as a dedication to St Wilfrid, who was bishop of Ripon from 667-669, by his many followers who were converting large swathes of northern England to Christinanity at this particular time – the cross then being the central focus as a meeting place for local Christians to hear the word of God. St. Mary’s Church, Masham, dates from the 12th-15th century (Norman and medieval). The tower dates from 1150, but an earlier Saxon foundation of the early 7th century from the reign of King Edwin of Deira and Bernicia (Northumbria) 616-633 stood near this site. King Edwin was baptised into the Christian faith in 627 and after his death in battle at Hatfield Chase he was venerated as a saint. There are still traces of Anglo-Saxon masonry in the fabric of the nave wall. Also in the church two pieces of a 9th century Anglian cross – notably part of the cross-head (looks like a small section of an arm) and a piece of the cross-shaft. Carter, Robert A., A visitor’s guide to Yorkshire Churches, Watmoughs Limited, Idle, Bradford, West Yorks, 1976. Categories: Ancient Crosses, The Masham Churchyard Cross In Wensleydale North Yorkshire | Tags: Ancient Crosses, Masham Churchyard Cross in Wensleydale North Yorkshire | Permalink.